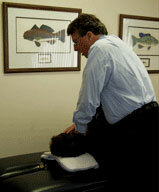 Gooing Chiropractic Clinic – Your Partner for Total Body Wellness! We are here to assist you in creating miracles in your life! The goal of Gooing Chiropractic Clinic is to restore health and well being to the sick and suffering using Advanced Health Care Techniques for mind – body wellness. We have answers you haven’t found before! When we restore your electrical bio-field, correct your subluxations, clear your trauma memories and restore the normal organ functions, your nervous systems functions properly. With diet and exercise your body can then regenerate itself to its proper healthy state. Every patient we care for is unique. It would be misguided for us to expect one technique or tool to care for everyone. That is why we customize your treatment plan. Our Doctors use various techniques and tools based on your personal findings. Our goal is to work with you to achieve total body wellness.